I really love being a blog ambassador for Brooks Running — and not just because I get the hook up on sweet kicks, although, of course, that’s a heck of a nice perk. It’s the community behind the brand, and it’s what they stand for. Speed, excellence, and hard work are certainly important, but kindness, inclusiveness, and encouragement are valued just as highly within the Run Happy community. a note with a reminder to embrace that Run Happy spirit, and few recommendations on how to do it. And that note got both Jenn and me thinking about the different ways we can all do just that, because whether you’re a competitive racer, a casual runner, or walking your 5k and just thinking about taking it up to a trot, taking each step with joy in your heart will certainly lead you to a win. 1. Say hi to fellow runners. A wave, a smile, a gasping hello — it’ll cheer them up and give you a reason to smile. 2. Run with someone faster — or slower. Challenge yourself, challenge a friend. 3. Leave a note. 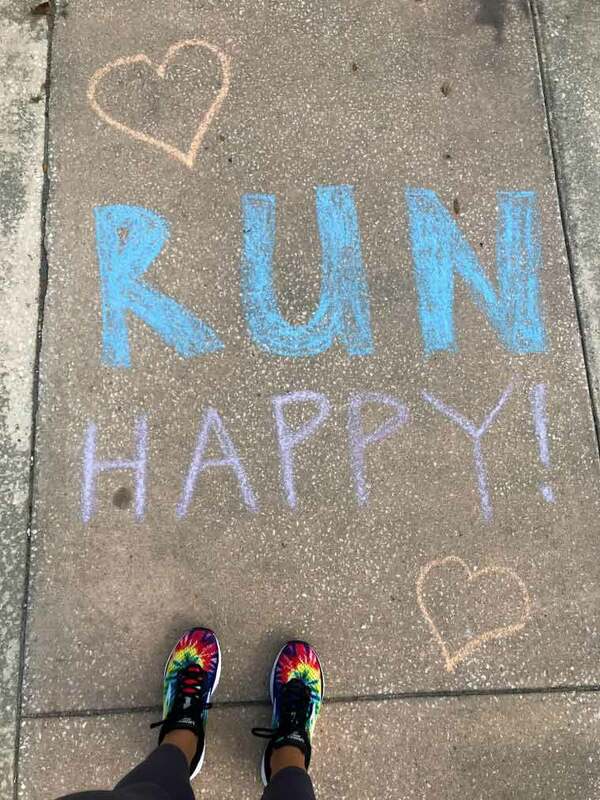 Sidewalk chalk is SO FUN, and who doesn’t love a random word of encouragement? 4. Find a new reason to run. Raise money for a cause, enter a racing series, join a relay team — you’ll be surprised at how fun it is to race when you’ve got an exciting reason to do so! 6. Join a club or a group. Joining a local track club or meeting up with a weekly group can give you some next level motivation. 7. Do something brand new. Usually a morning road runner? Head out in the evening and hit some trails or try a track workout. Love this! 1. Say hi to fellow runners. A wave, a smile, a gasping hello — it’ll cheer them up and give you a reason to smile. One of my favorite things about running is the community. When I pass someone on the trail, we nearly always acknowledge each other. When I’m in the car and I see a runner, I almost feel as if I know that person. I always wish them well. I also agree that freshening up the playlist pumps new energy into my runs; though some of the old favorites can do the same thing. And when I see a message written on the sidewalk, it always makes me smile. I hadn’t thought of leaving one myself, but now I will. Thanks for the inspiration! Oh, and I’ve been running in Brooks for more than 10 years now and love them! Those are amazing tips! Finding a new route is also really great. Running with a dog too.